This entry was posted on Thursday, July 28th, 2011 at 12:30 and is filed under Economics, Law, Politics. It’s bad enough that we must battle a President and a Senate that are fundamentally opposed to all things American. It’s ridiculous enough that some, including the vile chair of the DNC call the Republicans dictatorial. It’s a completely different matter that to fight for the future of our country, we will also be compelled to fight with Republicans who have been chosen to lead our efforts in the minority in the Senate, but particularly in our newly minted majority in the House of Representatives. The battle lines are being drawn as the leadership tries to herd its members who are actual conservatives. Now rises perennial republican ‘maverick’ John McCain to chime in with the editorial page of the Wall Street Journal in calling the Tea Party patriots: “Hobbits.” Senator McCain, who’s never been a friend to conservatives, yesterday destroyed his last chance to part on good company with me. All of this occurs against the backdrop of cries from Democrats to President Obama to simply drop the pretense, use faulty 14th Amendment arguments, and become a dictator. If the Republican Leadership in the House will not push their position now, what makes any think that under the duress of the moment, they will then obtain from some unknown magic the courage to do what such a scenario would demand? If the President of the United States attempts to use a fraudulent reading of the 14th Amendment to usurp the constitutional authority of Congress, the House of Representatives must act with clarion certainty and impeach him. Failure to do so would place an exclamation mark the death of the Republic. 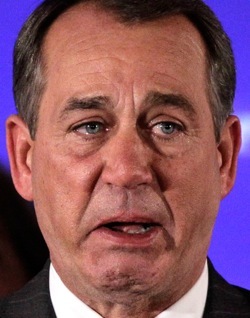 Speaker Boehner complains that the House Republicans constitute only one-half of one-third of the government. The Senate represents the other half of that legislative one-third of the government. Obama and his administration represent another third. This means that for all intents and purposes, fully one-half of our government is threatening open insurrection against the US Constitution, and what’s worse is that there are those who are begging them to do so. Mr. Speaker, since you’re not willing to fight, why don’t you go have a good cry about it? For a change, you’d actually be in step with your party’s base. Watching your abandonment of principles in DC, many of us have tears of despair in our eyes and in our hearts. Speaker Boehner and his self-defeating plan will be used by Democrats to maintain their power, but of course, Republicans will now get the blame, and by going along with this disgusting maneuver, selling out their principles in the name of a deal, and remaining silence in the face of looming tyranny, they will have deserved it. sad that you have fallen prey to the leftist rhetoric. Boehner is showing more spine than anyone in the GOP right now. I can no longer follow you or support your rhetoric that will destroy us. Mark, you got it right once again! With all of the back-stabbing going on in DC over this debt deal, I'm surprised there are any conservatives still breathing up there! The time is coming fast for us in the Tea Party to get our pitchforks out I'm afraid!! I read a report by the CBO stating that the proposed cuts Boehner has in his plan are something like, $317 BILLION instead of the TRILLIONS he promised. His position has not changed one bit from the last negotiation where he caved in to Obama and Reid. I really thought will all of the speeches from Boehner stating he was not giving in and it was going to be up the the White House to be the ones to compromise this time, that he had finally found his backbone, but after seeing this report from the CBO, I see he is pulling another fast one over on us yet AGAIN! This is just outrageous! He needs to be replaced with someone that is willing to what is best for the country and NOT what is best for the Republican party, which is what he is doing. I always thought Michelle Bachman would have made a much better Speaker than Boehner, and maybe those who elected Boehner are finally seeing why now!! Keep up the great work, Mark!